For health care professionals Gary Combs ’87 and Jamie Combs ’87, there is no greater calling than to serve others and help those in need, whether it is providing Seahawks with opportunities to pursue their education or administering medical assistance to patients. 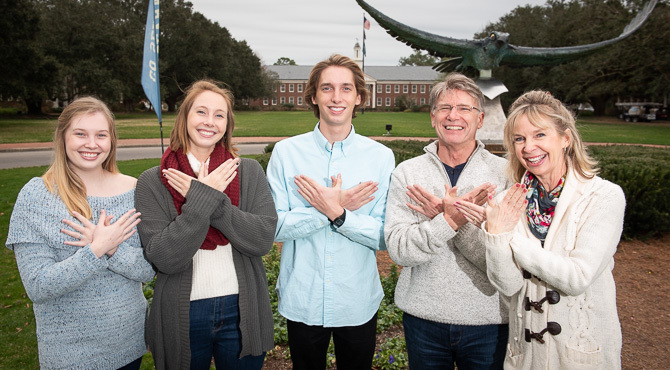 When their children, Cassidy ’20 and Cory ’22, decided to follow in their footsteps and attend UNCW to become nurses, the Combs were humbled. Gary and Jamie Combs, certified registered nurse anesthetists with New Hanover Regional Medical Center, are among the first graduates of the RN-to-BSN program at UNCW. Prior to completing the RN-to-BSN program, the Combs received an Associate in Arts degree in Nursing from UNCW in 1984. Julie, the Combs’ oldest child, became a Seahawk like her parents, but took a different career path. She completed the 2-plus-2 program for engineering at UNCW then transferred to NC State, where she completed her degree in industrial systems engineering in May 2018. For Cassidy, nursing wasn’t her initial goal. Overtime, she realized there was nothing else she would rather do. “I haven't found other things in my life that I am more passionate about than medicine and being able to help others,” she said. After graduation, Cassidy plans to work in a trauma unit in the Raleigh area and then pursue a doctorate in anesthesia to become a nurse anesthetist. Volunteering at New Hanover Regional Medical Center influenced Cory to pursue nursing. He plans to work in medical facilities overseas after graduation. “I enjoy meeting new people while helping others,” he said. The university has provided the Combs family a foundation to do great things, said Jamie Combs. “UNCW taught us and encouraged us to be the best that we can be, to think outside of ourselves and to care for others,” she said. The Combs’ support for the Seahawks goes beyond their children. They both serve on the UNCW Parent’s Council and are donors.